What a refreshing YA read this was. It's the kind of story you don't want to put down, not because its suspenseful or quickly moving, but because there's an ease to its storytelling that's so warm and familiar. It's the type of novel that pulls you in, surrounding your thoughts, only to leave you with a warm feeling inside upon its finale. As a fan of strong, emotional YAs, I felt this particular story hit all the high notes, leaving this reader very satisfied. Beatrix is an artist who is discovering her passion through medical drawings. She is hopeful to attend a school that will fulfill this dream, but she knows her family's financial strains is an obstacle on this journey of hers. So she sets out to gain a scholarship, but first she needs the inspiration to create a scholarship-worthy piece. While taking the night bus home, she meets Jack. He is every bit charming and mysterious. Immediately the two young adults form a connection without truly knowing who the other one really is. As Jack exits the bus, he accidentally leaves a clue behind that causes Beatrix to alter her plans and discover the truth about this strange boy. During this magical summer, Beatrix discovers more than just an inspiration for her scholarship piece. She uncovers secrets about her own family, that eventually leaves her questioning her own path. Alongside her though, sits Jack. They learn to trust one another, open up, and lean on the other. Their friendship, which turns to a blossoming young romance, was a delight to witness. But as the end of summer nears, so does Beatrix's and Jack's intentions. I was swept up in how deep their relationship quickly became, full of emotional depth and a solid storyline. Sometimes it takes meeting a stranger in order to veer you down a different path. And that different path has its own way of leading you to exactly where you're meant to be. "Sometimes it takes meeting a stranger in order to veer you down a different path. And that different path has its own way of leading you to exactly where you're meant to be." 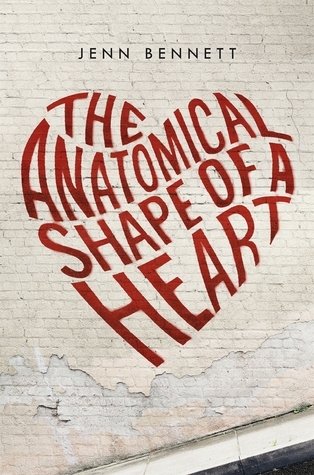 --> These two lines sum up this book PERFECTLY, G. I really enjoyed THE ANATOMICAL SHAPE OF A HEART, and it was definitely because I'm partial to stories like it! I love seeing how one event can cause so much change in a person's life, especially because I have similar stories to share. Lovely review!